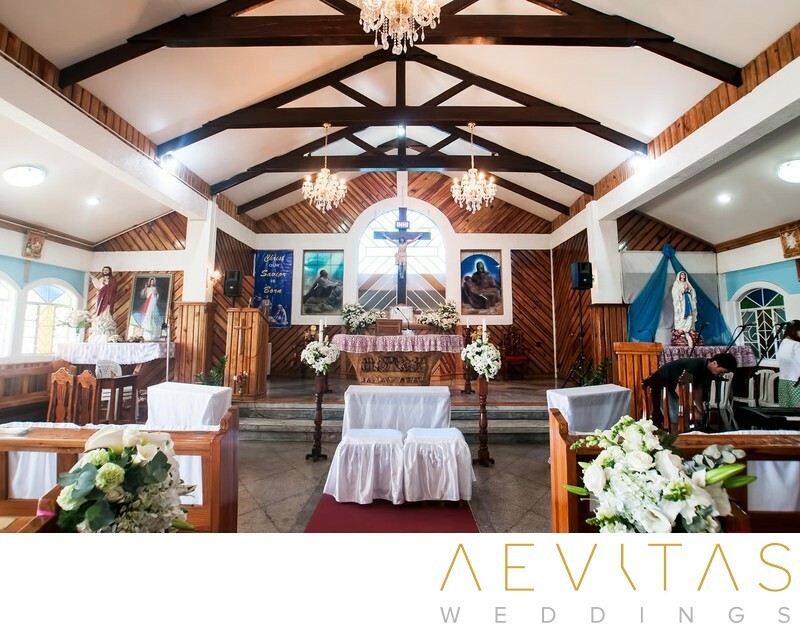 Located in the mountainous landscapes of Baguio City, the Scout Barrio Chapel is a charming Catholic church that is ideal for intimate wedding ceremonies. It’s proximity to the Camp John Hay Golf Course Clubhouse makes it easily accessible for couples having a destination wedding in the Philippines with family and friends from abroad. Not only is there plenty of accommodation available, but also a number of tourist attractions nearby amidst lush mountainous surrounds. Elegant interior features and religious motifs in Scout Barrio Chapel provide the perfect backdrop for Catholic couples wanting a traditional setting to exchange vows. Ceremonies can be tailored to incorporate rituals and rites that are important to you and your families, with the option for either a full Catholic ceremony or a shortened version. You can opt to add your own personal decorations or floral elements throughout the chapel, adding color and elegance as you walk down the aisle, or hire a string quartet to provide live music at the start and end of the ceremony. Large windows let in plenty of natural light at the Scout Barrio Chapel, allowing for well-lit wedding photographs without the need for flash. Flexible rules regarding wedding photography also enable up-close candid shots of your reactions and expressions throughout the ceremony, as well as those of your family and bridal party. As you exit the Scout Barrio Chapel, be flowered with rose petals by family and friends as you celebrate becoming newly married. You can capture couple portraits, bridal party portraits and family formals in front of the altar after the ceremony, then head into the nearby hills in a classic car to take advantage of the atmospheric lighting conditions. The Scout Barrio Chapel is perfect for couples wanting a traditional Catholic ceremony within intimate, beautifully-lit surrounds, whilst still being within easy reach of Baguio City and the tourist complex of Camp John Hay Golf Course Clubhouse.